Who hasn’t heard about famous bullfights which take place in Spain? The Bull and Matador are one of the main symbols of this south Europe country. Bullfights are the events which normally take place in so-called bullrings in Spanish Plazas de Torros during which trained humans called Matadors or Toreros are trying to subdue, immobilize or kill a bull in front of the broad audience. Bullfights come from the long-lasting traditions and are present till now. The bullfighting roots can be found in prehistoric times when the sacrification of the animals to the Gods was present. Originally around 5 different bullfighting styles existed in Spain. The most famous the “classic” one which is also called Corrida de Toros (running of bulls). During this type of the bullfights, three matadores are fighting against two bulls which must weight more than 460 kg. At the first part which is also called Tercio de Varas, the bull is teased around the ring and the first stabbing of the bulls upper neck part is performed by Picador. Tercio de Banderillas – the second stage involves 3 stabbing are performed one after another to the bull by banderilleros with short breaks in between. The third and the last part is Tercio de Muerte, in other words, Tercio of death. 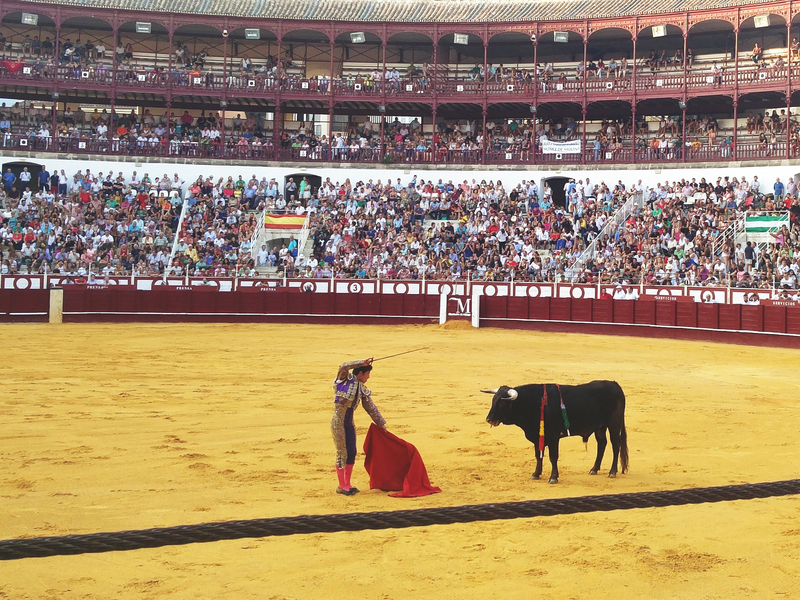 The matador in this stage is left alone in the ring with a red cape and a sword (Estoque) made out of the steel. The fight is ended when the torero stabs bull with the sword to the heart and the bull falls down dead. At the end of each fight, the judge/ president has to make a decision on how well the torero fight against the bull. The public can influence his/her decision by clapping, shouting and waving with the white color napkins. At the end, the horses take bull away from the ring and the torero is left to celebrate with the public. If you don’t know this fact you will probably never guess that the award for the well-performed fight is the ear of the bull. The matador must do incredibly well to be awarded by two bull ears. As a result, if you ever will go to the Museo de Toros you will find the Taxidermies of the bulls heads placed on the walls with missing ears. Not all Bull breeds are used at bullfights. In Spain, Portugal, France, and Latin America mostly Iberian breed is used most of the times. Bulls are specifically raised and very well treated for all their 3-4 years of life in the cattle raising ranch before it enters the ring. The most famous Spanish fighting Bull was called Raton (Mouse). He also was called the killer bull (el toro asesino). Raton in his bull career killed 3 people and more than thirty were injured. Since Spain has a long history of bullfighting the list of famous matadors is big. However, the most famous matadors as of today are Cayetano Rivera Ordóñez and Francisco Rivera Ordóñez, Emilio Muñoz, Enrique Ponce, Julio Aparicio Díaz to mention few. The red cape is often misunderstood. Bulls are colorblind and no matter what color is the cape it has nothing to do with the anger of the bull. The red color cape is normally used at the final part of the fight for the reason of hiding the blood of the bull. Bullfights happen not only in Spain. Bullfighting is taking place in Portugal, South of France, India, Tanzania, Mexico, Colombia. Apart of traditional well-known bullfighting called corrida, there are other types of bullfights. In Valencia and Castile bulls are not killed or injured. Also, there are no special outfits or very strict rules applied. This type of the bullfighting is called Recortes. Very popular style of bullfighting due to the Sanfermines or las fiestas de San Fermin celebration. It is called Encierros – men are running in front of the bulls on the streets of the city. Comic bullfighting, Toro embolado and many more styles of bullfighting are known to be performed. Another misconception, especially between tourists, exists in terms of frequency of bullfighting. Many think that these type of events are happing all the time which is not true. Actually more and more corridas are closed due to the change of conception of animal rights and big movements against such events. Instead of the bullfighting, you are able to attend the concert set at the Plazas de Toros. Bullfighting is common during the city celebration called Feria, or during very specific date such as San Fermin. It is true that for touristic reasons in some cities are more bullfighting performed during the year than in others. Bullfighting is a very sensitive topic and everyone has its own opinion about this matter. Let us know what you think about it. Do you support culture and traditions or you are more prone towards to support animal rights activists.